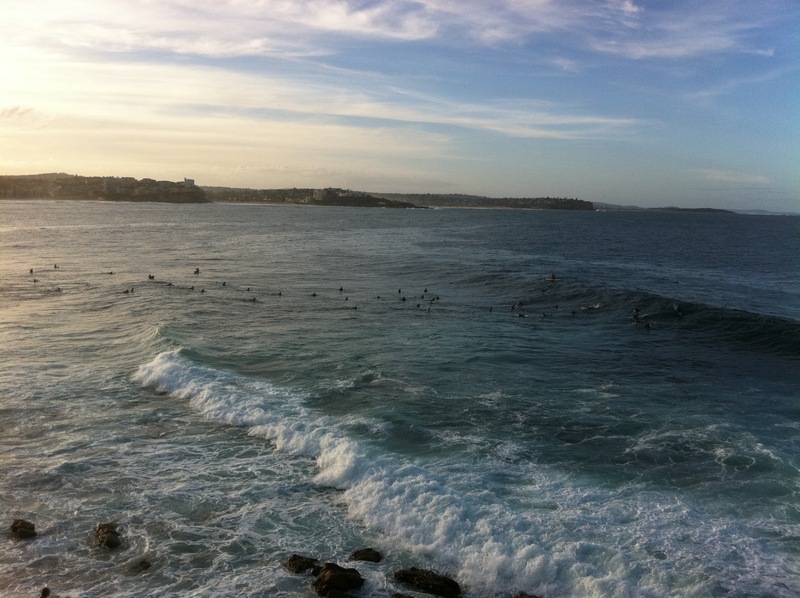 A great afternoon’s spectating can be had on the headland overlooking Fairy Bower when the surf is up and the surfing herd is out. There was at least 100 surfers and boogie boarders in the water on Sunday arvo and not all of them had the skills to exploit the conditions. Half the spectating fun is had watching good surfers taking off on steep faces and getting genuine tubes, whilst half the fun is watching the carnage as three of four guys try to take off on a wave and then plough their way through the heavy traffic of kooks and boards. When the surf is really big all 3 breaks come into play – these breaks being Dead Mans, Winkipop and the Bower. 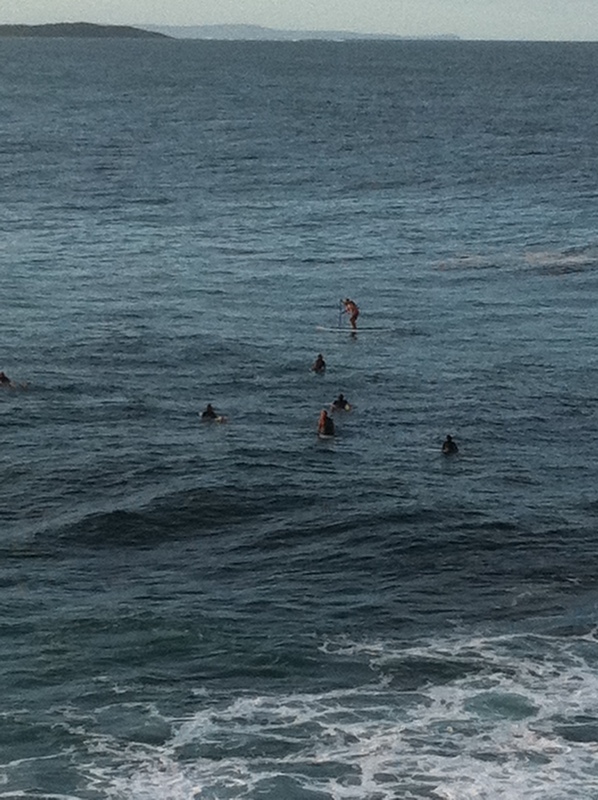 A great surfer (ie Kelly Slater) can catch a wave at Dead Man’s and go all the way through to the Bower. Sunday wasn’t that big, but it was entertaining nonetheless. Things were livened up by the presence of the latest scourge to board-riders – the SUP or stand-up paddleboarder. A SUP is a very large heavy board that is stable enough for its rider to literally stand up and propel themselves with a paddle. Waves can be caught further out than a short-board and the SUP can get right of way. The problem with the SUP is that if the rider comes off the SUP becomes a boardrider killer as it ploughs uncontrollably through a pack. When the pack is as thick as it was on Sunday, a SUP rider is as popular as a fart in an elevator, and on Sunday the SUP rider was not very proficient. How death or serious injury did not occur is beyond me. Having a beer whilst watching the action below makes the whole experience even more enjoyable. 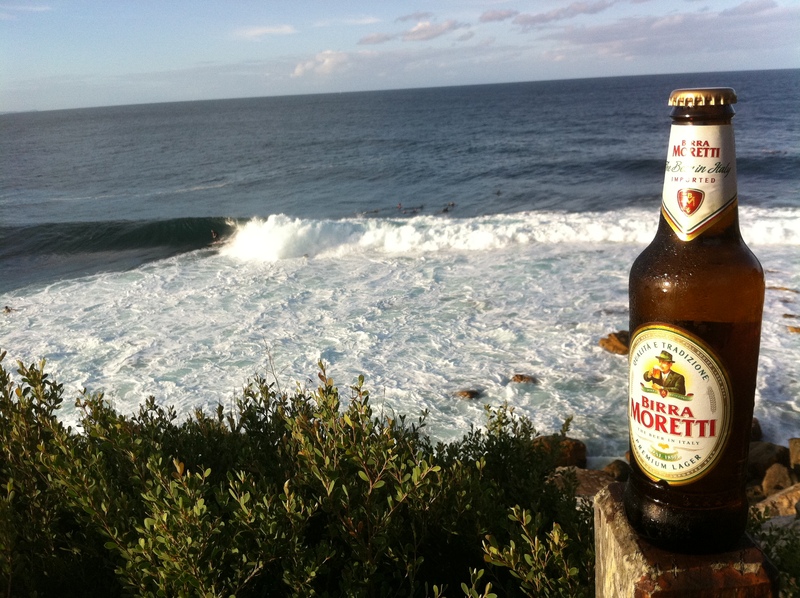 Birra Moretti is a fairly bland lager, which is now part of that avaricious acquirer of breweries – Heineken. The Premium Lager is one of 5 beers under the Birra Moretti logo. One is a zero alcohol version, but the other 3 varieties look far more interesting than the only variety that we get here in Oz. I think it was Tipples that made the observation that we only seem to get the blandest variety of these European beers imported into Australia. The Premium Lager variety of Birra Moretti is potable and quite sessionable, but you wouldn’t go out of your way for it. There’s a malty taste – but nothing exceptional. Luckily the surfing action provided more interest.